Some of the best childhood memories come from time spent with siblings. 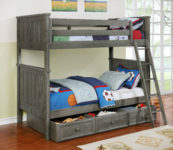 Not to mention, twin over twin bunk beds are a great way to save space and provide a fun sleeping arrangement. 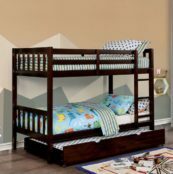 Kids Only Furniture carries largest array of twin twin bunk beds Los Angeles. 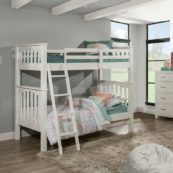 Important things to look for in twin bunk beds is the construction of the bed. 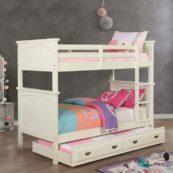 Because solid-wood constructed bunk beds tend to be more stable and last longer, they are better value. 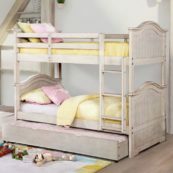 Also, you can utilize space by adding additional sleeping space for those sleepovers by including a trundle. Additionally, trundles under twin over twin bunk beds can double as extra storage space. 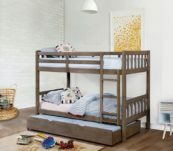 If longevity is not your concern, you can always opt for fun metal bunk beds. Because they also come in the twin/twin configuration, it might be they right choice. Moreover, adding a staircase with drawers or a locker to a twin over twin bunk is another way to create a fun and functional living space.